by a complementary RNA molecule. The ability to manipulate DNA has led to a new genetics. the human gene that encodes interferon into a bacterial cell’s genome. acquired the human interferon gene proceeded to produce interferon at a rapid rate, and to grow and divide. The millions of interferon-producing bacteria growing in the culture were all descendants of the cell that had originally received the human interferon gene. The human insulin gene has also been cloned in bacteria, and now insulin can be manufactured at little expense. Furthermore, cloning and related molecular techniques are needed to provide basic information about how genes are put together and regulated. the ability to cut DNA into recognizable pieces and rearrange those pieces in different ways. carried the gene into a bacterial cell. Most other genetic engineering approaches bring the gene of interest into the target cell by first incorporating it into a plasmid or an infective virus. cleave specific sequences of nucleotides in DNA. Most organisms eventually evolve means of defending themselves from predators and parasites, and bacteria are no exception. Among the natural enemies of bacteria are bacteriophages, viruses that infect bacteria and multiply within them. At some point, they cause the bacterial cells to burst, releasing thousands more viruses. that fragment the viral DNA as soon as it enters the bacterial cell. cleave the DNA at a particular place within the recognition sequence. 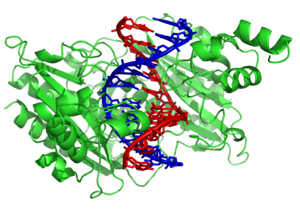 Why don’t restriction endonucleases cleave the bacterial cells’ own DNA as well as that of the viruses? to some of the nucleotides in the bacterial DNA. the endonuclease cannot bind to that sequence. the bacterial DNA is protected from being degraded at that site. is not protected from enzymatic cleavage. the two strands of the DNA duplex have the same nucleotide sequence running in opposite directions for the length of the recognition sequence. Two important consequences arise from this arrangement of nucleotides to be discussed. Bacteria and archaea have evolved mechanisms to protect themselves from viral infections so that viruses inject their DNA genomes into cells and the viral DNA hijacks the cell’s machinery A major protective strategy for the host is to use restriction endonucleases (restriction enzymes) to degrade the viral DNA. These particular base sequences the enzymes recognize are called recognition sequences or recognition sites. theycleave that DNA at defined positions. The most well studied class are the so-called type II restriction enzymes. Restriction endonucleases must show tremendous specificity at two levels. First, they must cleave only DNA molecules that contain recognition sites (hereafter referred to as cognate DNA) without cleaving DNA molecules that lack these sites. endonucleases must cleave cognate DNA molecules much more than 5000 times as efficiently as they cleave nonspecific sites. Second, restriction enzymes must not degrade the host DNA. How do these enzymes manage to degrade viral DNA while sparing their own? The restriction endonuclease EcoRV (from E. coli) cleaves double-stranded viral DNA molecules that contain the sequence 5′-GATATC-3′ but leaves intact host DNA containing hundreds of such sequences. The host DNA is protected by other enzymes called methylases, which methylate adenine bases within host recognition sequences (Figure 9.32). For each restriction endonuclease, the host cell produces a corresponding methylase that marks the host DNA and prevents its degradation. These pairs of enzymes are referred to as restriction-modification systems. Hydrolysis of a Phosphodiester Bond. All restriction enzymes catalyze the hydrolysis of DNA phosphodiester bonds, leaving a phosphoryl group attached to the 5′ end. The bond that is cleaved is shown in red. a pentacoordinate transition state is formed. the incoming nucleophile at one apex of the two pyramids and the group that is displaced (the leaving group, L) at the other apex. The two mechanisms differ in the number of times the displacement occurs in the course of the reaction. rules out the formation of any covalently bound intermediate (Figure 9.35). Cleavage of DNA by EcoRV endonuclease results in overall inversion of the stereochemical configuration at the phosphorus atom. Restriction endonucleases as well as many other enzymes that act on phosphate-containing substrates require Mg2+ or some other similar divalent cation for activity. What is the function of this metal? bound to oligonucleotides that contain the appropriate recognition sequences. when produced, the crystals are soaked in solutions containing the metal. No cleavage takes place, allowing the location of the magnesium ion binding sites to be determined (Figure 9.36). one is an oxygen atom of the phosphoryl group at the site of cleavage. helps polarize the water molecule toward deprotonation. Cleavage does not take place within these crystals. But a second magnesium ion must be present in an adjacent site for EcoRV endonuclease to cleave its substrate. 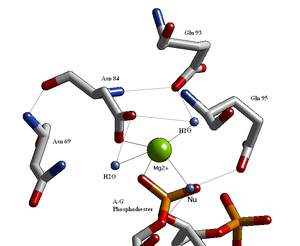 Magnesium Ion Binding Site in ECORV Endonuclease. The magnesium ion helps to activate a water molecule and positions it so that it can attack the phosphate. Specificityis the defining feature of restriction enzymes. The recognition sequences for most restriction endonucleases are inverted repeats. a twofold rotational symmetry (Figure 9.37). they are dimers whose two subunits are related by twofold rotational symmetry. by the determination of the structure of the complex between EcoRV endonuclease and DNA fragments containing its recognition sequence (Figure 9.38). The enzyme surrounds the DNA in a tight embrace. Structure of the Recognition Site of ECORV Endonuclease. (A) The sequence of the recognition site, which is symmetric around the axis of rotation designated in green. Structure of the ECORV – Cognate DNA Complex. This view of the structure of EcoRV endonuclease bound to a cognate DNA fragment is down the helical axis of the DNA. The two protein subunits are in yellow and blue, and the DNA backbone is in red. 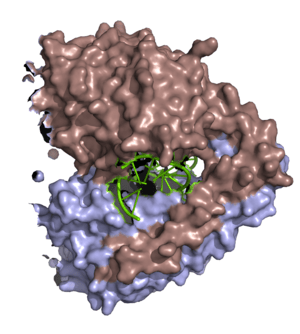 one projecting from the surface of each enzyme subunit (Figure 9.39). The most striking feature of this complex is the distortion of the DNA, which is substantially kinked in the center (Figure 9.40). The central two TA base pairs in the recognition sequence play a key role in producing the kink. They do not make contact with the enzyme but appear to be required because of their ease of distortion. 5′-TA-3′ sequences are known to be among the most easily deformed base pairs. The distortion of the DNA at this site has severe effects on the specificity of enzyme action. Hydrogen Bonding Interactions between ECORV Endonuclease and Its DNA Substrate. One of the DNA-binding loops (in green) of EcoRV endonuclease is shown interacting with the base pairs of its cognate DNA binding site. Key amino acid residues are shown. Distortion of the Recognition Site. The DNA is represented as a ball-and-stick model. 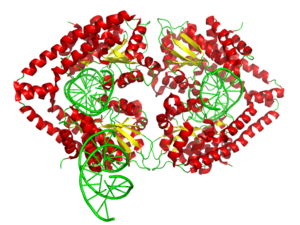 The path of the DNA helical axis, shown in red, is substantially distorted on binding to the enzyme. For the B form of DNA, the axis is straight (not shown). the enzyme binds to all sequences, both cognate and noncognate, with approximately equal affinity. the noncognate DNA conformation is not substantially distorted (Figure 9.41). the complete catalytic apparatus is never assembled. Nonspecific and Cognate DNA within ECORV Endonuclease. We can now see the role of binding energy in this strategy for attaining catalytic specificity. additional contacts are made between the enzyme and the substrate, increasing the binding energy. there is little difference in binding affinity for cognate and nonspecific DNA fragments. However, the distortion in the cognate complex dramatically affects catalysis by completing the magnesium ion binding site. This example illustrates how enzymes can utilize available binding energy to deform substrates and poise them for chemical transformation. stabilize the transition state leading to DNA hydrolysis. Greater Binding Energy of EcoRV Endonuclease Bound to Cognate Versus Noncognate Dna. The additional interactions between EcoRV endonuclease and cognate DNA increase the binding energy, which can be used to drive DNA distortions. the methyl group’s presence precludes the formation of a hydrogen bond between the amino group and the side-chain carbonyl group of asparagine 185 (Figure 9.43). This asparagine residue is closely linked to the other amino acids that form specific contacts with the DNA. the distortion necessary for cleavage will not take place. Type II restriction enzymes are prevalent in Archaea and Eubacteria. What can we tell of the evolutionary history of these enzymes? the presence of a core structure conserved in the different enzymes. This structure includes β strands that contain the aspartate (or, in some cases, glutamate) residues forming the magnesium ion binding sites (Figure 9.44). A Conserved Structural Core in Type II Restriction Enzymes. Four conserved structural elements, including the active-site region (in blue), are highlighted in color in these models of a single monomer from each dimeric enzyme. a selective advantage in a particular environment. indicative of a close evolutionary relationship. as is known from sequence comparisons of other genes and other evidence. more recently than the time of their evolutionary divergence. suggests that the gene did not originate in E. coli. Horizontal gene transfer may be a relatively common event. genes that inactivate antibiotics are often transferred, leading to the transmission of antibiotic resistance from one species to another. protection against viral infections may have favored horizontal gene transfer.